Just a quick manicure I did some time last week, before the crunch really set in for my craft stuff. Unfortunately as a result of the weaving, and the 1.5 mm steel crochet hook, my nails died. So after this there'll be nubbins. For the base colour I used 3 coats of a Claire's pink that I have dubbed "pepto". It was in a set of pink and red minis. Then I used one of the red sparkly minis from the same set and Sinful Colors Tokyo Pearl to do the toothpick roses. The leaves are Sinful Colors Show Me the Way. 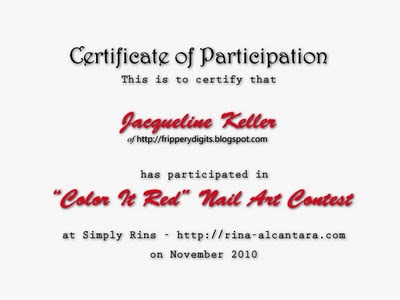 This mani along with my Aerosmith one are both in the Fab Nail Arts gallery for this week's Pink Challenge. Thanks Mae and Thriszha! 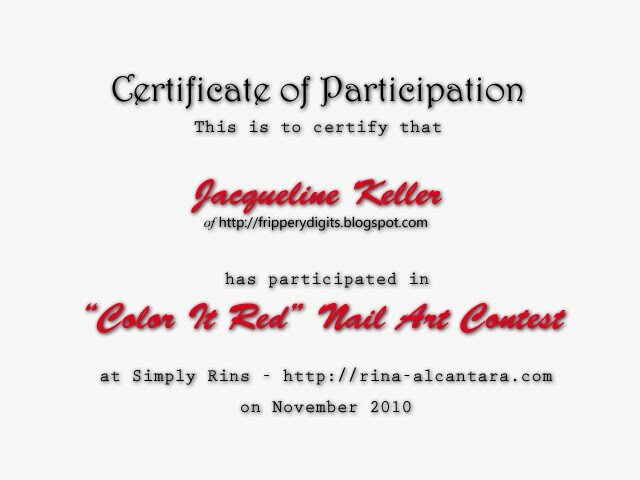 A big thank you to Rina at Simply Rins for giving me a certificate for participating in her nail art competition! 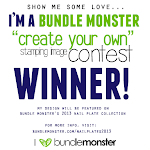 I'll keep it at the bottom of my blog as well! :) Thanks I had fun! My daughter's bedroom used to be three separate, hideous shades of pink when we first moved in. The best description we could come up with was pepto gone bad. I think your pepto pink is much prettier. i love the colors and oh ur aerosmit mani is really rock!